Oh snap, WE HAVE US A MOVIE HERE, PEOPLE!!! Lauren and I saw it together, and I think it's fair to say we were rather blown away. Man, goosebumps. Goosebumps all over! A couple tinny, false, overdone moments by Rosamund Pike (less is more, girlfriend! ), but altogether a harrowing tale that's part Passion Play and Ten Little Indians, with dashes of Dances with Wolves, The Outlaw Josey Wales, Pale Rider, Unforgiven, and Lone Survivor tossed in for good measure! It tackles some really deep human emotions (loss, fury, contempt, resentment, bitterness), methodically and painstakingly baking a seven-layer cake that concludes in one of the tastiest arcs imaginable inside of 133 minutes. It reminds me a lot of Terrence Malick's Days of Heaven or The New World, which—I know sounds ridiculously crazy—but is nonetheless true! Not only in some of the lighting, sure, but also in its profoundly wordless, quiet ways. Here...throughout...pictures paint a thousand words, and Christian Bale says so much while saying so little. And boy, he gets to cry and cry and cry and cry. Wail. Grieve. And give as good as he gets. And roil and rage and so much movie-deliciousness more. I'm not saying it's always pleasant, or always perfect, or always entertaining, but it's almost always simple, true, and real, and in a Disneyfied/DC-Marvelized world, well, that's special. 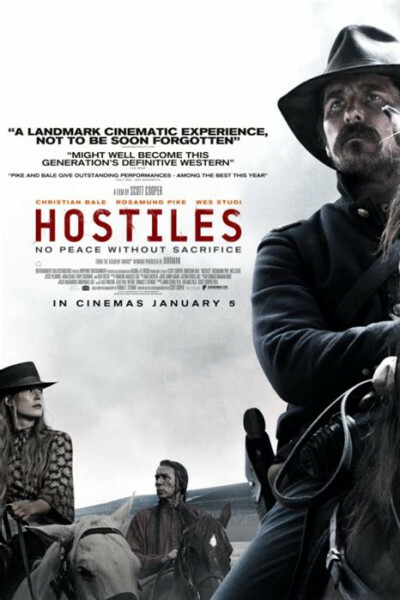 If you relish the work of Taylor Sheridan (Sicario, Hell or High Water, Wind River), you'll dig Hostiles. And if you miss plain ol' good storytellin', here's a good story about how the west was...won? Alas, it's somewhat savage at times (maybe 10 minutes' worth, sprinkled throughout? ), so if you're squeamish, I'd say that's a pass. But if you love you some bona fide westerns, and don't mind a few scalpings now and again, well pardner, go on and get.